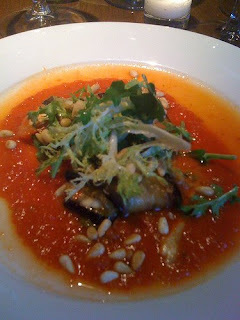 A few weeks ago I attended a winemaker's dinner at Betty Restaurant on Queen Anne Hill with a group of friends. This was a special one-night only dinner with special guest, Edgardo del Popolo of Dona Paula Estate Winery in Mendoza, Argentina. The dinner consisted of four courses plus six different wines. Edgardo spoke with everyone to explain the difference of each of the wines we tasted that night. Before dinner was served, we started our wine adventure with a 2008 Cardos Sauvingnon Blanc. This was a good wine to start with as it was very light. This dinner came at a perfect time as my friends and I were all in Buenos Aires, Argentina at this time last year. So this was a perfect way to celebrate a one year anniversary of that trip. The food and wine in Argentina is amazing and I highly recommend visiting Argentina to sample their delicious food, their rich history and their wonderful culture. Our dinner started with Rolled Eggplant with Fresh Mozzarella, Arugula Pesto and Red Peppers. Accompanied with this we tasted the 2007 Dona Paula Estate Sauvingnon Blanc. This wine was also pretty light. 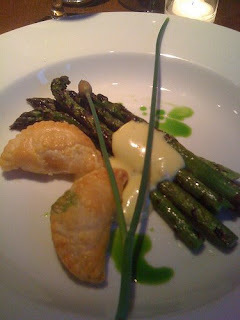 Our second course were Potato-Chive Empanadas with Grilled Washington Asparagus and Roasted Garlic Aioli. The Empanadas were delicious! The Asparagus and Aioli tasted great together. The wine for this course was a 2007 Dona Paula Estate Chardonnay. I'm not a huge Chardonnay fan, but this one was pretty good. 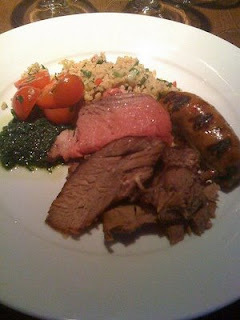 The third course was a Trio of Meats (sausage, chicken, beef) with Spring Bulghur Salad and Chimichurri Sauce. All three meats were very tasty. My favorite was the sausage. 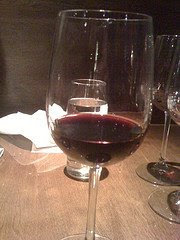 The wine for this course was a 2006 Dona Paula Estate Shiraz-Malbec. This wine was delicious. Our fourth course was dessert. 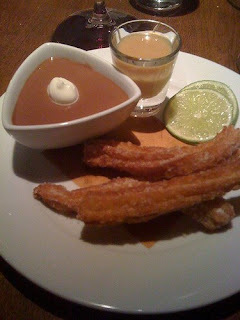 We were served delicious House Made Churros with Chocolate Pudding and Dulce de Leche. The Churros were very good, and they tasted even better when dipped in the Chocolate Pudding and Dulce de Leche. 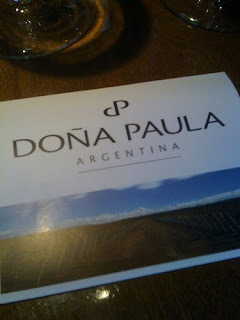 With our dessert we were served a 2007 Dona Paula Estate Cabernet Sauvingnon. This was probably my favorite wine of the night.